Two oldies at auction. First, a TOC "webless" glove sold for $2173. Condition was fair. Seams on both the thumb and forefinger. Second, a "Full Finger Tipped"(??) glove sold for $3185. It is great for what it is historically, the last of the supersized and padded gloves used by catchers in the late 1880's before the advent of the Decker mitt and pillow style. It's a wonderful example of the Joseph Sauer's patented design of 1888. The super rare glove originally surface on ebay some years ago and was discussed at length on the forum site. 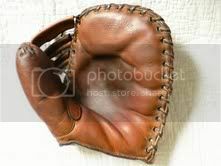 This was the glove that resided in the National Pastime store on Main Street in Cooperstown many years ago. When the store went away, it was sold on eBay. When Joe Phillips, TGC, was kind enough to send me all the catalog reference material for "The Vintage Baseball Glove Catalog Source Book" this other glove copy was contained within hundreds of pounds of paper. So, there are two of them out there, a lefty and a righty. Mike has done some great research on the Sauer patent of 1888 and this is an important glove. I stand corrected when I originally thought it was a total hybrid Frankenstein glove years ago. Then I saw the patent. One can see the dimpled attachment points of the palm padding on JD's photo, something unfortunately worn or gone away on the auctioned Sauer's glove because of the repaired section. Joe kindly sent me a binder of extra glove info when he sent JD all the catalog material. I have posted some of it such as the J.A. Peach article and a few cool ads. JD, if the Sauer's glove photo's are any indication, you must have a treasure trove of ancillary material that came with the catalogs. A 1920's Ken-Wel glove sold for $95. It is in very good overall shape with an intact die cut web, patented back panel and nice patch. A circa 1957 Rawlings model LMX "Royal Label" catchers mitt sold for $50. Top of the line in its day. The mitt is in very nice original condition and a model not often seen. A super Pennant Brand "Lou Gehrig" mitt sold for $1750. It's a high quality buckle back model with great factory markings and endorsement. A 1930's Goldsmith "Chick Hafey" glove sold for $203. The high quality glove shows a fair amount of use but seems all intact. A tough endorser. A circa 1920 Reach model D base mitt sold for $227. Overall in real nice shape. It features a buckle web, intact cloth patch. A circa 1915-20 Spalding fast back style base mitt purported to be a George Sisler gamer sold for $2772. Nice mitt on its own but provenance very weak from the auction house. Second is another Rawlings, this one an XPG3-P. This glove features the basket web and "Wingtip" back panel. It was basically given away at a BIN of $28. There is some spotting on the front and back that happens from storage and climate conditions. With proper cleaning and conditioning, those spots go away in a heartbeat. Third is a 1950's Wilson "Gus Mancuso" model 2420 catchers mitt that sold for $88. Nice vintage look to it. Some gloves form Hunt's live All-Star Game auction. The big winner was the J.C. Higgins "Jackie Robinson" glove that sold for $690. USA made amid all the import Caprico models out there. The stamped endorsement was good. A Higgins a "Lou Gehrig Jr." mitt sold for $517. A clear factory stamped endorsement. A Hutch "Cy Young" glove sold for $230. Nice endorsement. A Spalding "Babe Ruth" model 199 glove sold for $402. Made in the 1940's, this may be one of the last Ruth endorsed Spalding models. It looks great from the front but lots of ink signatures on the back surely kept the price down. A nice Spalding "Sam Leslie" base mitt sold for $250. Top of the line in the mid 1930's, the mitt features the snap button wrist strap patterned on the old Bennie Bengough catchers mitt. Overall, the "All Star" model mitt is in fine nick. I like the athletic tape wrapped web, a nice period touch! A Spalding model DX "Double Play" base mitt sold for $140. it has an initial inscribed on the back and a slightly worn patch but overall the mitt is in nice shape. Great markings on the face. A Rawlings "Warren Spahn" model XPG3 HOH glove sold for $262. The selling price is way above your average Spahn model. This model XPG3 was made for only one year, 1962 and was sandwiched between the earlier "Herb Score" XPG3 glove and the multitude of "Flex-O-Matic" models beginning in 1963. This '62 model Spahn XPG3 has the "lazy S" pocket lacing and is a pretty rare bird. I looked up the historical selling prices. They were high. The glove itself looks to have been played with for only a season or two and is in great original condition. Picked this really nice looking Geo. Sisler mitt on a Best Offer. Got a nice discount as well. Can't wait to receive it! Last edited by Mike**Mize on July 28th, 2016, 12:16 pm, edited 1 time in total. An early J.C. Higgins glove sold for $559. It has the popular combination of a full web with buckle back wrist strap. This white leather model looks to be in good shape. I like the leather wrapped buckle. A D&M grommet web mitt sold for $175. Seems in good shape. D&M tag is intact. A 1930's Leacock brand "Major League" model glove sold for $167. Intact cloth patch and good markings on the face.